This promo is open to BPI Credit Cardholders who will receive the Insta-Prize 2 insert containing a unique 10-character code issued with their Monthly Billing Statement and customers who will receive the inserts with their ZALORA and Foodpanda purchase during the promo period until supplies last. BF Jade E-Services Philippines, Inc. reserves the right to disqualify all winners that do not meet the rules and regulations of the Insta-Prize 2 Promotion. These include hacking, code mining or any other means of interference or attempt to interfere with the Platform, or any activities on the Platform. You agree not to obtain or attempt to obtain any materials or information through any means not intentionally made available through the platform. You agree neither to modify the platform in any manner or form, nor to use modified versions of the platform, including, without limitation, for the purpose of obtaining unauthorized access to the platform. You also agree that you will not use any robot, spider, scraper or any other automated means to access the platform for any purpose. Failure to comply will result in the forfeit of prizes. 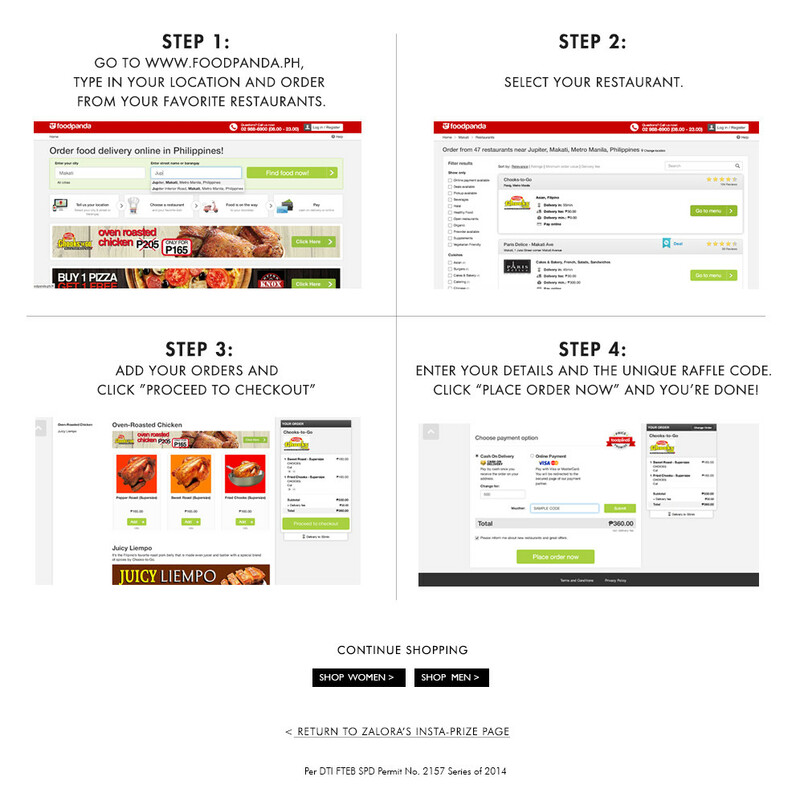 Prizes involving Foodpanda gift promos are (a) valid for one-time use only for each registered customer at http://www.foodpanda.ph (b) not valid in conjunction with other promotions or discount codes. Foodpanda Philippines reserves the right to change the terms and conditions, or cancel any promotion, at any time without notice. There will be up to 3 winners of the grand prize (Apple Macbook Pro). 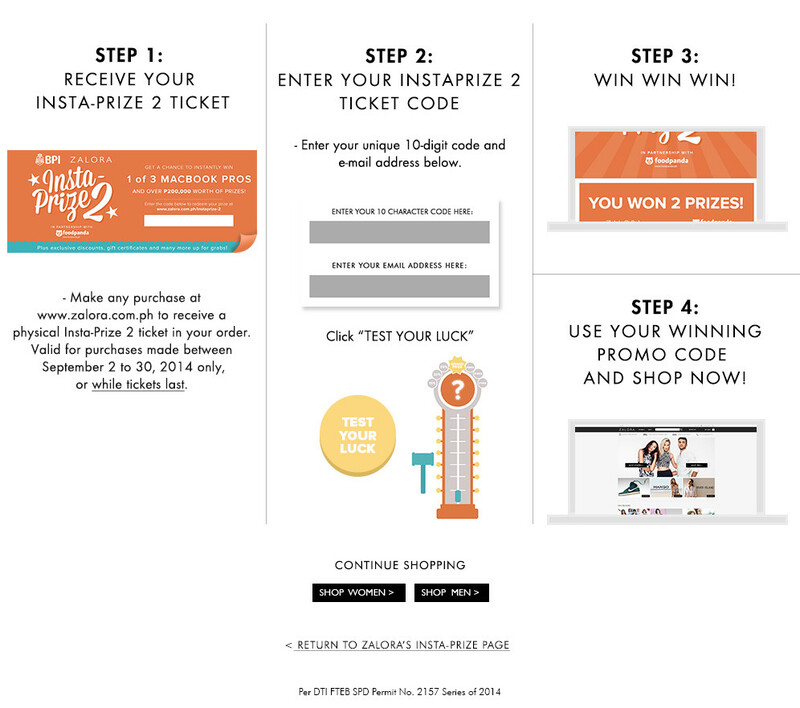 The winner must send a screenshot of the winning pop-up to customer@ph.zalora.com and bring the original insert or print-out of e-mail in order to claim the prize. The grand prize may be claimed at Level 2, B-7 Bonifacio High Street, Bonifacio Blobal City, Taguig, Philippines 1634. Look for Nathaniel Lee (+632 858 0709). to the use of the information submitted on the contest entry form, without compensation, for BF Jade E-Services Philippines, Inc.’s Insta-Prize 2 partners’ (Bank of the Philippine Islands and Foodpanda Philippines) promotional and marketing purposes.